I'm learning to sail in the self-taught school of sailing. It is exhilarating. I'm learning to sail. This is something I've always wanted to do, something children who live on lakes or by an ocean learn before puberty, and something, as a 55-year-old novice, I am taking on as a later-life challenge. I feel a bit foolish out there--this greying pilot plowing a 14-foot Sunfish--an entry-level trainer--across nearby Eagle Creek Reservoir, trying to work the angles, feel the wind, adjust the sail, practice smooth turns, and generally avoid capsizing too often. Others in my age range sail by on 25-foot cruisers trimmed perfectly to catch the wind. No matter: I'm determined first to become safe, then good, then very good at sailing. There appears to be no sailing school around these parts at this time. So, I checked sailing books out of the public library and watch instructional videos on YouTube. I'm teaching myself how to sail, hoping I don't pick up too many bad habits before some seasoned sailor can properly show me the ropes. At this point, I'm going by the book, but already understanding that part of sailing relies on feeling, sensing, and being nimble to respond to the wind, sail, land, and other boats. This all started while riding bikes with my friend Rabbi Aaron Spiegel. Somehow, we got to talking about the wind as we rode along and I said I'd like to learn to sail. "I have a Sunfish and I will give it to you, " he said. 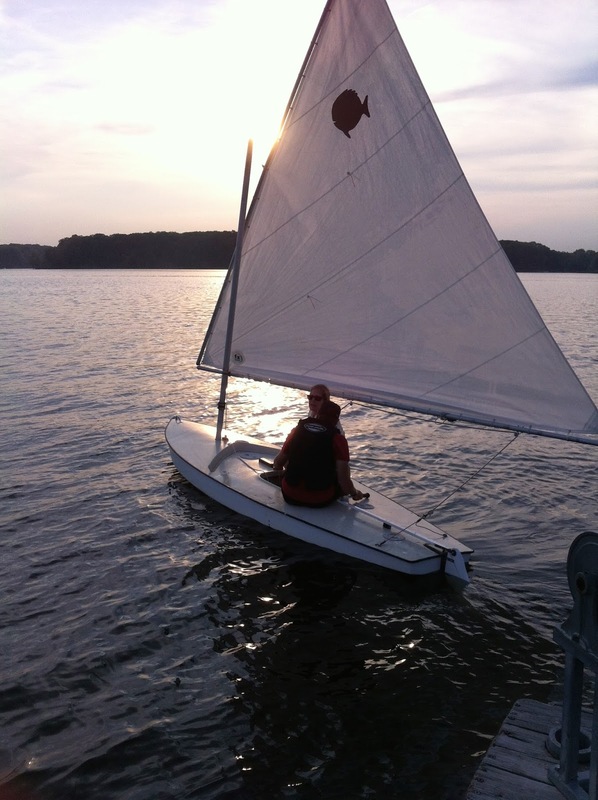 "I have a bigger sailboat I keep at Eagle Creek and I never use the Sunfish. You can have it." So, I gratefully received it and have been spending a few hours out on it whenever I get a chance. Aaron showed me his sailboat. It is named "Ruach." "That's Hebrew for 'Wind,' 'Spirit of God,'" I said. "Yep," he affirmed. "You're one of only a few who knows what that means." "What do you suggest I call the Sunfish?" I asked him. "Call it 'John's Folly,'" Aaron quipped. Sounds good. John's Folly it is. I lean back against the wind, holding the tiller in one hand and the mainsail rope in the other, feeling the wind tug at the sail and listening to the bow of the boat cut through the water. It's an incredible feeling. No gasoline-powered engine is propelling me; the wind is silently drawing me forward across the lake. At this point, I'm most fascinated by sailing into the wind. Upwind sailing relies on the same principle that airplane wings use for lift. But instead of a horizontal lift, a sailboat uses vertical lift. Sailing into the wind at either 10 o'clock or 2 o'clock at the maximum possible speed requires sailing on an invisible edge. If I head too directly into the wind, the sail luffs and I lose power. If I head too far away from it, the boat slows. I'm learning to find the immediate wind direction by sensing its pressure on my ears and then guiding the boat to the best 10 or 2 o'clock angle--and then clipping along. I'm also trying to be more courageous to let the wind take the boat more to one side and lean completely back and out on the other side to keep it balanced enough to sail fast without capsizing. I confess, this is the most exhilarating and fearful part of sailing for me so far. I've got a lot to learn about sailing. Mostly, I read and then try out on the lake what I read in the books or see in the video demonstrations. Who knows, I may become a decent sailor in a few years. Until then, just steer clear when you see me coming. Bon voyage! Looking forward to a sailing lesson from you next week or something? !